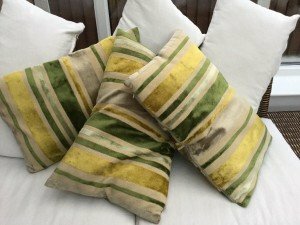 A set of three rectangular sofa cushions, upholstered in mustard and green striped velour. 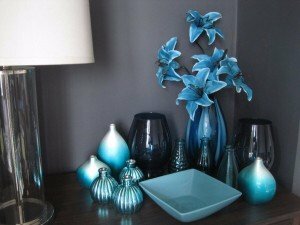 A collection of turquoise blue decorative accessories, to include a large vase containing faux flowers, eleven various sized vases and a square dish. 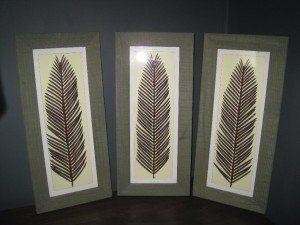 A set of three framed wall canvases depicting metallic red leaves. 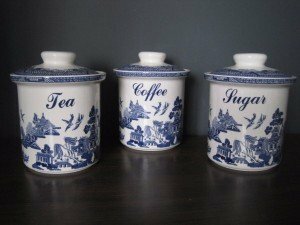 A set of ceramic tea, coffee and sugar canisters, decorated with the blue and white willow tree pattern. 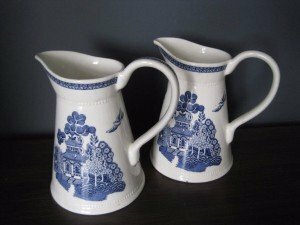 A pair of decorative large ceramic milk jugs, decorated in the blue and white willow tree pattern. 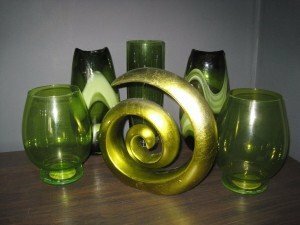 A collection of green decorative accessories, to include a pair of green glass vases, a pair of green and white swirl patterned vases, a tall cylindrical vase and an unusual shaped ornament. 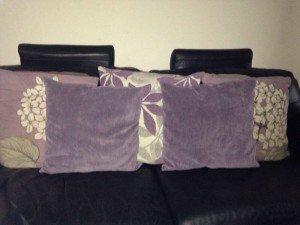 A collection of five lilac sofa cushions, two are plain lilac, two with an embellished floral pattern, the other with a floral pattern. 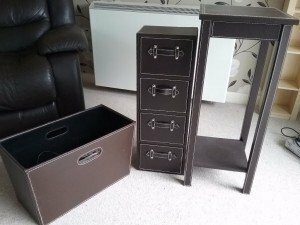 A tall standing side table upholstered in faux chocolate leather, together with a matching chest of small drawers and a magazine holder. 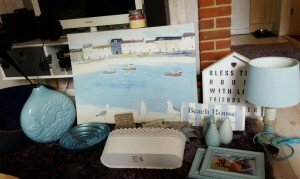 A collection of nautical themed decorative accessories, to include a wall canvas depicting boats on the sea scene, a blue vase with faux flowers, a circular dish, wall plaques etc. A small porcelain dinner service decorated with a floral print, comprising of a large milk jug, dinner plates, side plates and teacups. 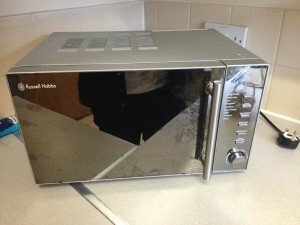 A Russell Hobbs Stainless steel mirror fronted combination microwave. 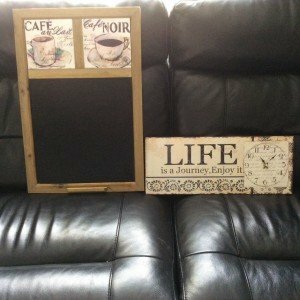 A shabby chic menu chalkboard in a wooden frame, together with a shabby chic wall clock. 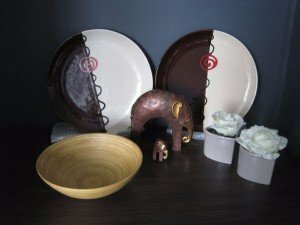 A small amount of decorative accessories, to include a pair of circular dishes, a fruit bowl, two elephant ornaments and a pair of faux plants. 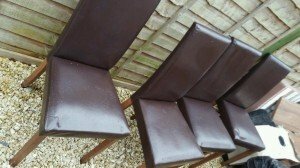 A set of four matching dining chairs upholstered in chocolate brown faux leather, on wooden legs. 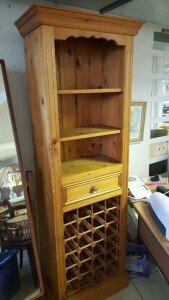 A solid pine kitchen dresser, having two removable shelves, a drawer underneath and a 24 wine rack. 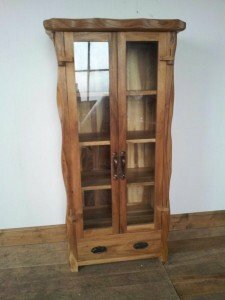 A unique solid pine double display cabinet with glass inlaid doors, having four shelves to the inside and a drawer underneath. 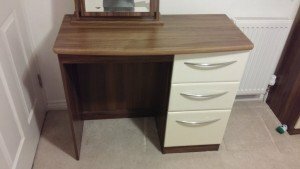 A cream gloss and walnut dressing table desk with three drawers, together with a removable swing mirror. 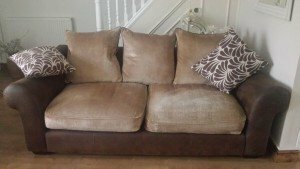 A large two seater sofa upholstered in brown and cream suede, together with two leaf patterned cushions. 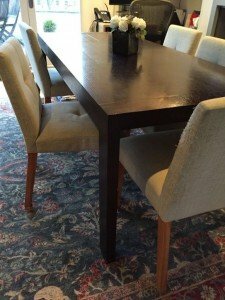 A solid wood black rectangular dining table, together with five low back dining chairs on wooden legs, upholstered in cream cotton.